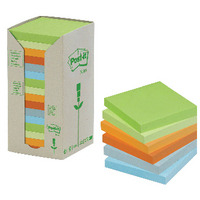 Post-it Notes Recycled Tower Pack 76 x 76mm Pastel Rainbow (Pack of 16) 654-1RPT Pack of 1 3M Post-it Recycled Notes Tower. Notes made from 100% recycled material, Tower pack offers easy storage while eliminating individual plastic wraps. Tower pack also made from recycled materials. 16 pads, Assorted Pastel Colours 76 x 76mm. 100 sheets pads. 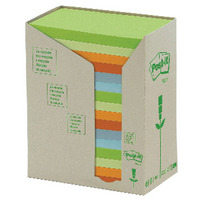 Post-it Notes Recycled Tower Pack 76 x 127mm Pastel Rainbow (Pack of 16) 655-1RPT Pack of 1 3M Post-it Recycled Notes Tower. Notes made from 100% recycled material, Tower pack offers easy storage while eliminating individual plastic wraps. Tower pack also made from recycled materials. 16 pads, Assorted Pastel Colours 76 x 127mm. 100 sheets pads. 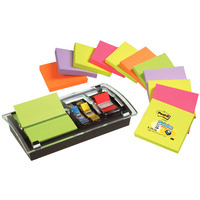 Post-it Designer Z-notes With Dispenser (Pack of 12) DS100-VP Pack of 1 3M Post-it designer collection combi dispenser for Z-Notes and Post-it Index flags. Ensures your Post-it notes and flags are within easy reach for one-handed dispensing. 1 designer combi dispenser, 12 Pop-up refill neon pads and 1 Index flag sample pack. 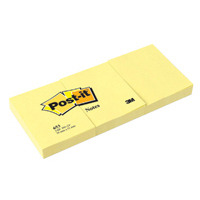 Post-it 38x51mm Canary Yellow Notes (Pack of 12) 653Y Pack of 1 3M Post-it Notes Canary Yellow The original colour Post-it note!. Ideal for making notes or leaving messages and reminders. Post-it Notes in canary yellow. Each pad 38mm x 51mm 100 sheets per pad.